Theoretically, Saturday could've gone worse for the Sixers, but it's hard to imagine how. Joel Embiid played, and while he was brilliant at times, you could tell he wasn't himself. The Sixers got next to nothing out of three of their five starters. Amir Johnson got caught checking his phone while the team was down double digits in the fourth quarter. Ben Simmons was not thrilled with the crowd booing and didn't hide it. And the worst part? 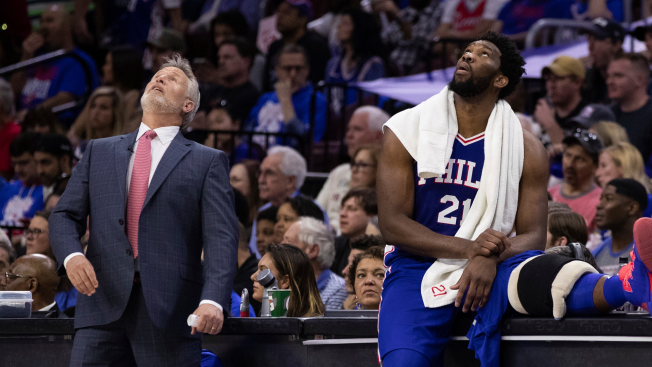 The Sixers, who've supposedly embraced their lofty expectations, fell behind 1-0 in their first round playoff series after a 111-102 loss to the Brooklyn Nets at the Wells Fargo Center. But therein might lay the silver lining. The Sixers aren't likely going to panic, but a loss in the first game of a series their heavily favored to win was surely a wake-up call. "It's an eye-opener, if that's what you [want to] call it," Jimmy Butler said. "I'm telling you, we're going to be fine. We've got practice, we've got a day to recoup, then we'll be back on this same floor come Monday." Even for the most level-headed and optimistic, it's fair to be a little concerned. The team's issues from the regular season crept back up at times. The chief concern is still the health of Embiid. Embiid gave it a go, but didn't look right. He tried a knee brace during his pregame warm-up, but decided against wearing it during the game, saying it caused pain in his calf. While pain management is the biggest thing facing Embiid, there is definitely still an issue of fitness level. Embiid hadn't played in a week and missed 14 of the last 24 games of the regular season. Because of that fatigue, he often settled for jumpers instead of continuing to get to the line like he did to start the game. "Hopefully, I'll feel better and gain a couple more of my athletic abilities so I can be more down on the block," Embiid said. "Jimmy did a great job [Saturday] attacking. We couldn't back him up so Monday we've got to do a better job." With JJ Redick, you just kind of have to take the good with the bad. What he does on offense with his shot-making and movement away from the ball opens everything up for his teammates. Defensively, his lack of size and athleticism make him a liability. Tobias Harris' struggles are troubling. He slumped into the playoffs, shooting just 27 percent from three over his final 19 games. He played a team-high 41 minutes, but wound up with just four points. His season-low was six. Still, Harris has proven he can get hot and carry this team offensively. He just needs to get out of his own head. The biggest concern is the disturbing pattern we've seen with Simmons. Brad Stevens gave the rest of the league the blueprint to stop Simmons and Kenny Atkinson followed it in Game 1. Simmons' lack of shot is hurting him, but so too is his lack of aggressiveness in looking for his own shot. "I do know that he completely cares," Brett Brown said of Simmons. "His experience from the playoffs last year -- you want to improve from that and you want to show all the fans all the work he definitely has put in. Tonight, you would've have seen that. He will be back and maybe there is some truth to what you just said, where he's over thinking it and trying to overanalyze stuff. That could be true, but I will tell this room, I would be shocked if you don't see a different Ben Simmons in Game 2." The fans are hoping to see a different Sixers team in Game 2.